Do you ever cut up gift bags to use as wrapping paper? Sometimes a gift bag will have a tear in it, but much of the bag is still in good shape and makes nice gift wrap. Other times, I figure I can wrap several smaller gifts with one bag, by cutting the bag into squares and rectangles. That's what I did with one of the cellophane Easter bags -- cut up and wrapped chocolate-coconut egg nest candies. I was able to cut one small cellophane bag into 4 pieces, just enough for the wrap for 4 candies. For some of my gift bags, I feel they are just too nice to cut up, and prefer to keep them whole to reuse multiple times. But some bags seem more single-purpose, and suited for cutting into gift wrap. For this job, wrapping candies for gifting, I thought the cellophane had a nice, finished look. Your welcome, Belinda. Have a wonderful Easter weekend! That's a great idea for the wrapping of smaller candy. I'll be doing that! The cellophane bag was a perfect fit for the four candies. I was really pleased. I hope this works equally well for you. Have a wonderful Easter weekend, Mary. Have a wonderful Easter weekend too, Lili! 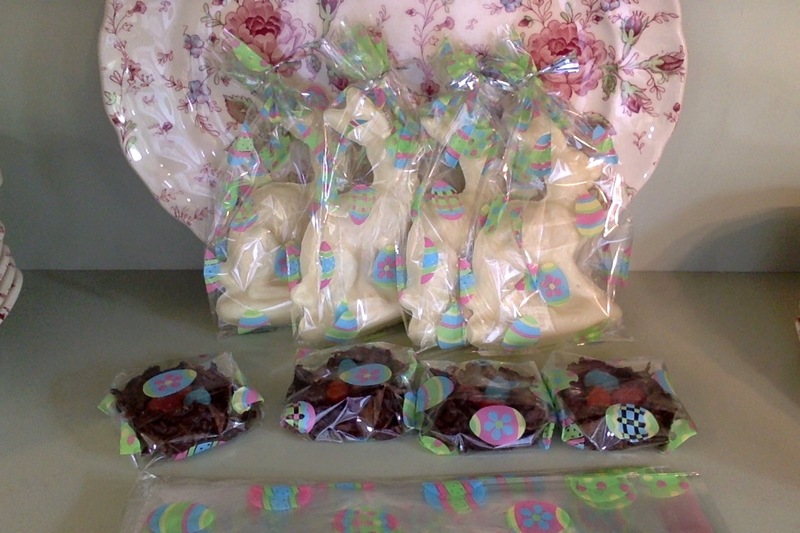 Your little Easter candies look very good in your wrappings. I also save deflated Mylar balloons for wrapping, sometimes cutting them up and sometimes using the whole thing like a bag. we save the deflated mylar balloons, too. I have a couple in the gift wrap cupboard waiting to be used. I like the idea of turning them into gift bags. Thanks for that tip. Have a lovely Easter weekend, live and learn! This is something that never crossed my mind... Genius! I will sure be doing this in the future. Got me thinking about some of the the shopping bags you get a purchase in but has the store name. I have covered the store name with craft paper and reused....but this is an idea I may be using with those now also. Thanks much! Happy Easter! That's a great idea for the store bags. I do have a few very nice ones, too, but hesitate to use them for gifts because of the store logo. I will definitely be cutting up those bags, too. Have a wonderful Easter weekend! That is such a clever idea. I love it and I will use it.